For our readers who don't know much about you, tell us about yourself and your background? I've always been involved in sport from a very young age, and used to compete in cross country running for Norfolk from the age of 8-13, then from this I got into triathlon which I really enjoyed however cycling was my best and most enjoyable discipline. My passion for mountain biking started after a family holiday to Scotland where we hired bikes at Fort William, this was an awesome day and as soon as we returned home I ordered myself a Specialized Hot Rock! I started racing on my mountain bike at a local road race and kept up with the roadies. My love for racing grew and I spent all of my savings on a new Boardman carbon road bike which I won regional races on, then took on the Nationals and came 6th at my first National road race in 2013. 2014 was a year with many turning points; I was at a mountain bike race at Hadleigh Farm when I went over the bars, had a fit, fell unconscious, was rushed to hospital for a CT scan, but luckily I didn't have a head injury, although I had broken my collar bone. However, 4 weeks later I became the Regional MTB Champ and a short while after this I got my first National podium coming 3rd at Margam Park. Everything improved from here, coming 2nd at the following National and 1st at the final round. In September of this year I was selected by British cycling to be an Olympic Development Apprentice which helped me progress in this amazing sport. My goal for 2015 was to become National Mountain Bike Champion and I won all of the Nationals leading up to it then the big day came... after all of the build up, preparation and training I was absolutely thrilled (and relieved) to cross the line in 1st place! This was a moment I will never forget, all of my family came to watch and Hadleigh is my home course (Eastern Region) and it holds lots of memories such as breaking my collar bone, becoming regional and national champ and hopefully another great memory will be made after the Junior world cup round 5 is held there in July. In October 2015 I joined a new MTB team Renvale RT. I can't believe how amazing this team has been for me, if it wasn't for them I wouldn't have started cyclocross. I had won all regional CX races in the past on my hybrid bike but I had never raced a cyclocross bike. Renvale got me a couple of cyclocross bikes and before I knew it after a couple of local races I had won my first Junior National race and came 4th elite woman. My thoughts after this... cyclocross is awesome! I then raced the remaining Nationals and won all of them including becoming National Champion which took a while to sink in as it all happened so quickly! 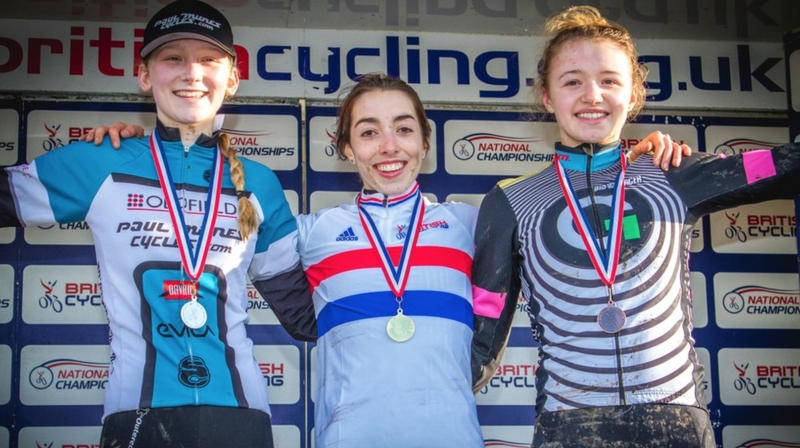 Finally, the icing on the cake was finishing the cyclocross season off by not only winning the last round of the Junior National trophy but also taking victory in the Elite women's race! Although it's not an obvious MTB Mecca, the Eastern region seems to be thriving with lots of events, good attendance and emerging talent. Why do you think it has become such a XC hotbed? The Eastern region has the biggest regional MTB series in the UK: Mud Sweat and Gears which just keeps growing and growing in popularity. Despite the fact that Norfolk is one of the flattest parts of the country! The team at MSG always put on great races with a fantastic atmosphere and they make the most out of the terrain. Furthermore, these regional races have been a big part of my cycling journey as they've allowed my racing spirit to grow and I've made great friends from them. Your Renvale RT teammates had been raving about what good form you are in, what have done differently this year as you step up into the Junior ranks to raise your performance level? 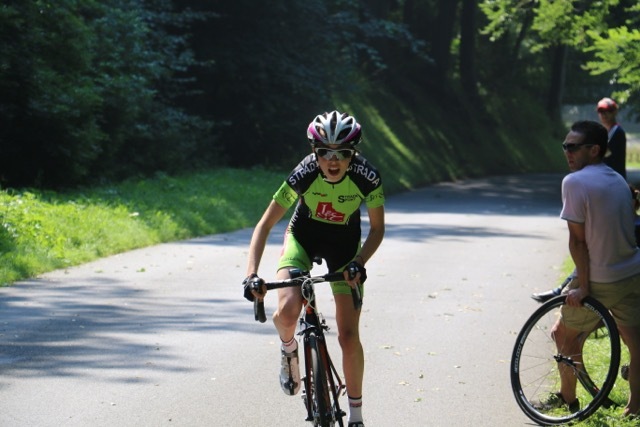 In October I was selected by British Cycling to join the Junior Academy which is brilliant, and I think the combination of training and having a great relationship with my new coach, all contribute to why I'm in good form. Renvale RT have stepped up to support you this year, how much of a difference has that made? Renvale RT have been such an amazing team, not only are my teammates amazing but the support they've given me is brilliant. I wasnt planning on racing cyclocross last year but they got me couple of CX bike and before I knew it I was the National Champion within a few months! How do you successfully balance school work and training? I'm currently studying Physics, Maths, Economics and Business A level and trying to balance school with training and racing is sometimes hard but I think as long as you're organised, plan ahead and manage your time then you can do both successfully. 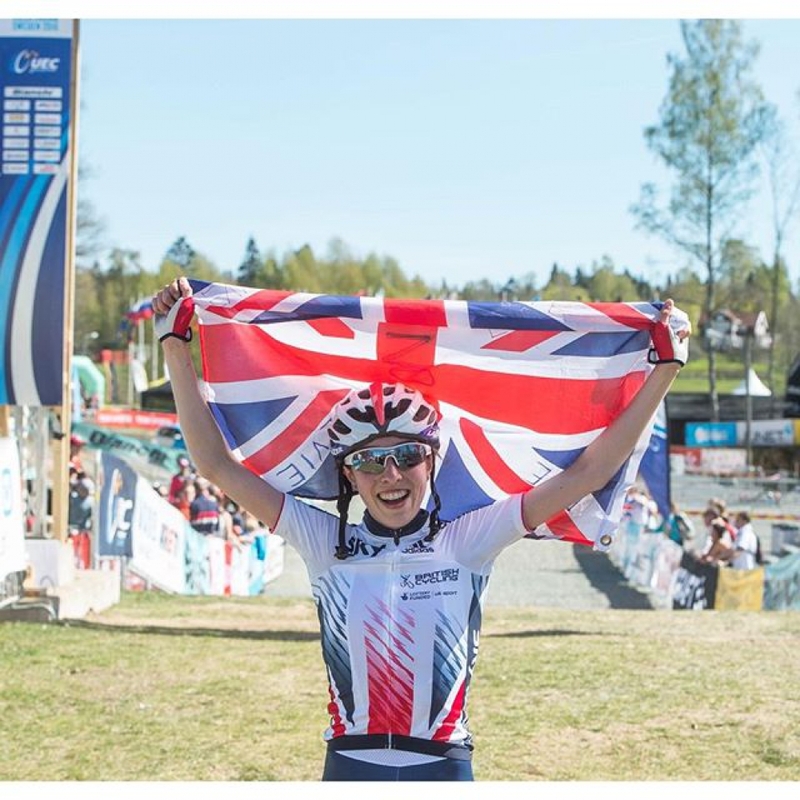 British Cycling have received a lot of criticism recently over their support of XC racing and of women's racing in general but I don't think that is entirely fair as the support of the Junior XC programme is very good. Could you tell us what it is like to be part of that programme and share a positive side to the story? Being part of British Cycling's Junior Academy is a privilege and I'm very grateful for all of their support. 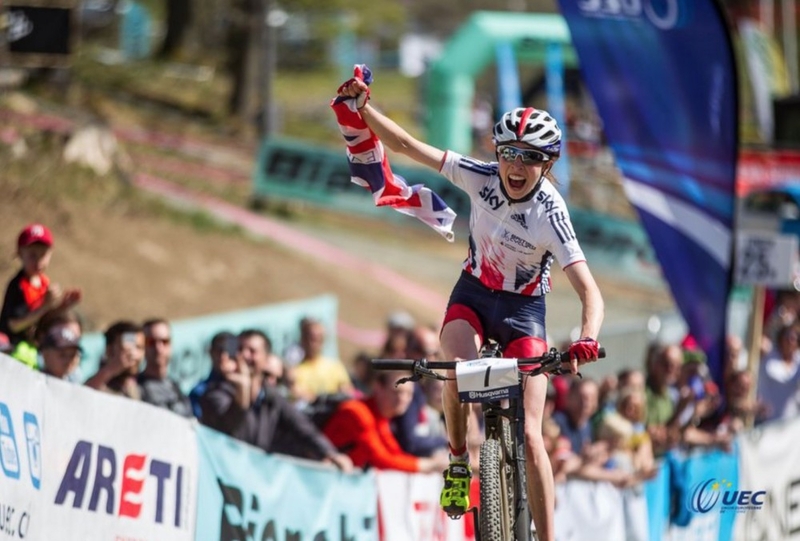 2016 has been the first time I've raced internationally and going away with the GB MTB is awesome! The support is fantastic and everything is so well organised which helps relieve any stresses, allowing us riders to focus 100% on the racing. 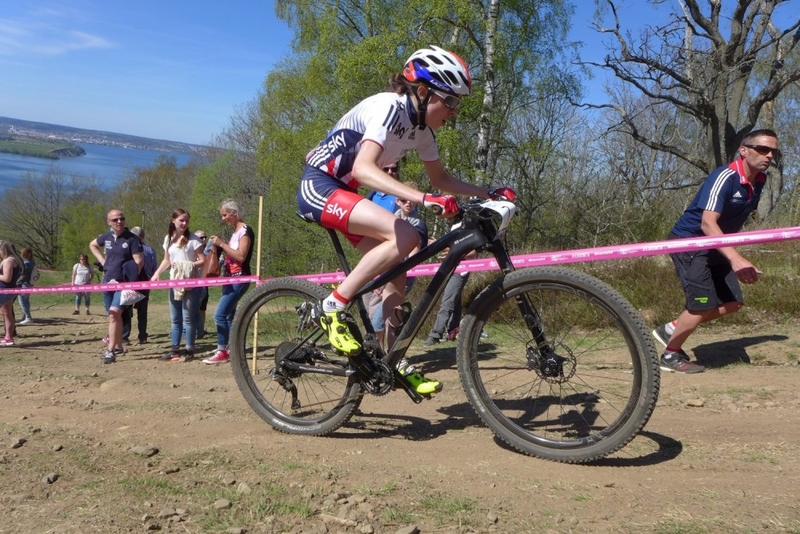 BC want to see their riders performing at the top level and winning, and I think with the huge support behind the GB team we're in a strong position when competing against the main MTB XC countries like France and Switzerland. There seems to be so much success with the young British racers at the moment, what is it like to be part of that? Do you think that the success Grant and Evie have achieved rubs off on the entire team? I think when riders from the GB team achieve top results, this encourages other team members and boosts moral within the team. There is a lot of debate about technicality of courses at the moment. What's your opinion? What are your favourite courses? I used to think UK MTB courses were fairly technical, however, having now raced abroad and experienced World class courses the technicality of UK courses doesn't seem too hard. 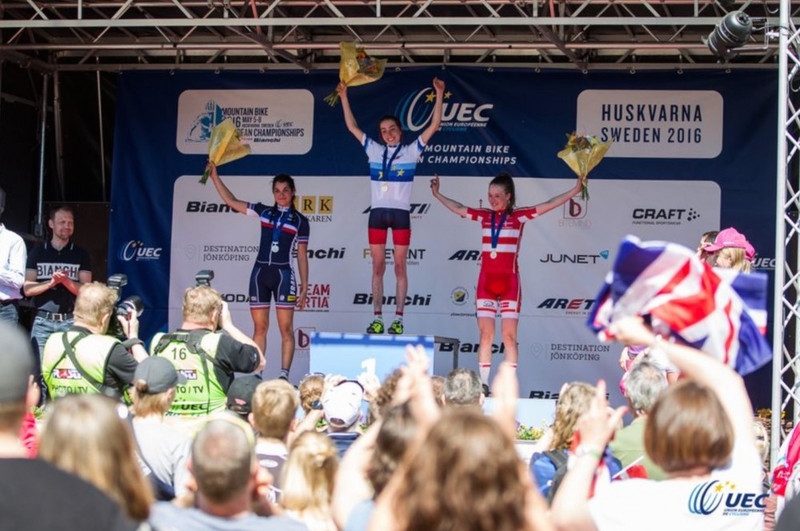 I think it would be cool to make UK courses more technical (providing there are B lines for less capable riders) as it will decrease the step up to racing at an international level. Tell us more about your goals for 2016 and what you'll be doing in the run up to the Nove Mesto World Championships in June? The atmosphere and some of the course features there are legendary, are you doing specific preparation for those? I can't wait for the World Champs in Nove Mesto, this will be my main 2016 goal and I've heard the course is awesome and hilly which is what I love! After becoming European Champion I'll be going into the World Champs with confidence and looking forward to some epic racing! Finally, how about longer term dreams? Where would you like to see yourself in the future? Hopefully as a nation we can qualify more spots for the 2020 and 2024 Olympics. Also see you did a good ride at the Lincoln Grand Prix so is road racing on your radar? I race road and cyclocross as well as MTB which I really enjoy, in fact a week after the European Champs I came 3rd in the National Road Race Champs. I love the speed of the road and the mud fest and running of cyclocross, and also hope to be going to the World CX Champs this season. My future goals are Tokyo 2020 Olympics and future Olympics, Commonwealth Games, World Cups and World Championships. My ultimate goal is to win a gold medal at the Olympics for MTB XC!